Opinions and guesses wanted. Yes I do want my readers to have a look at this name and give their best guess as to what it is. The name is "OLIVER PRICE xxxxx". What is the last name? 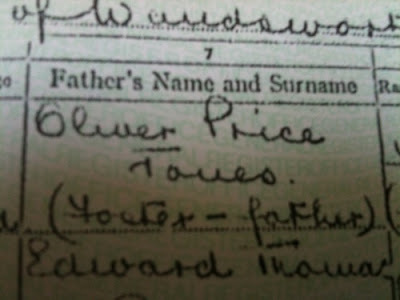 At first I thought the upper case letter was a "T" but it doesn't match how the writer formed other "T" as in "Thomas"
Here's another example of upper case T. It is nothing like the first letter of Oliver Price's surname. Then I thought perhaps it is "F"? 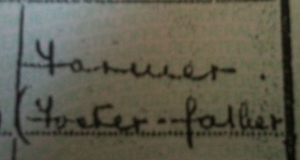 But look at the word "Farrier" and "Foster-father" F isn't formed the same way as the start of this surname. F has a distinct horizontal line/bar through the middle and a curving top that looks almost like a Y. The first letter in the surname above does not have that "Y" top. My final thought is "J". Perhaps the surname is JONES or JANES? All ideas/suggestions/opinions welcome! And if you find Oliver Price unknown in any record I'd be forever grateful. Playing in the Google+ playground is fun. 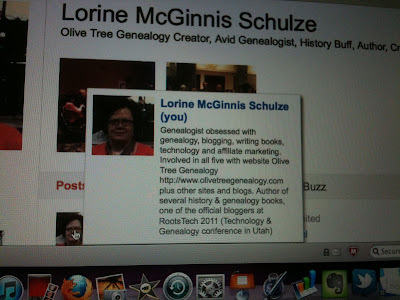 I've been to a lot of Hangouts, have set up a couple myself and am making lots of new genealogy friends! But he is on Google+. So today I had a link for a story he might want to read. 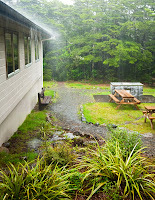 I went to my Stream (Home page) in Google+ and put the link into my SHARE box. I then chose ONLY his name to share with and hit SEND. He got it in two places - his email and his Google+ Stream. It was almost instantaneous. He liked it in Google+ because it also showed him a photo, a bit of text and the link to the article. No one but him will see this link because I also disabled the ability for it to be reshared or commented on. 2. Want a longer description that displays when folks hold their cursor over your Profile Photo box in Google+? The default is a few words that you entered on your Profile page. I'm using my friend Joan Miller of Luxegen Genealogy's Profile page and popup as an example of the default. Well here's my tip for you - go to the About part of your Profile. Choose "Edit Profile" In the "employment" area, write up a brief bio and put it in the spot for your employment. Click the "current" box and Save it. Now when someone hovers their cursor over your name and photo, your bio will display. Here's what my popup looks like now. I like that people who find me on Google+ can now see at a glance what I'm all about. If they want to they can continue on to my Profile page to learn more. My PadPivot arrived last week. It's a special swivel holder for the iPad, Kindle, Nook and a few other devices. Ordering the PadPivot was an interesting experience. I was one of the many thousands of backers (4,823 by their official count) who used Kickstarter to back the project in its infancy. 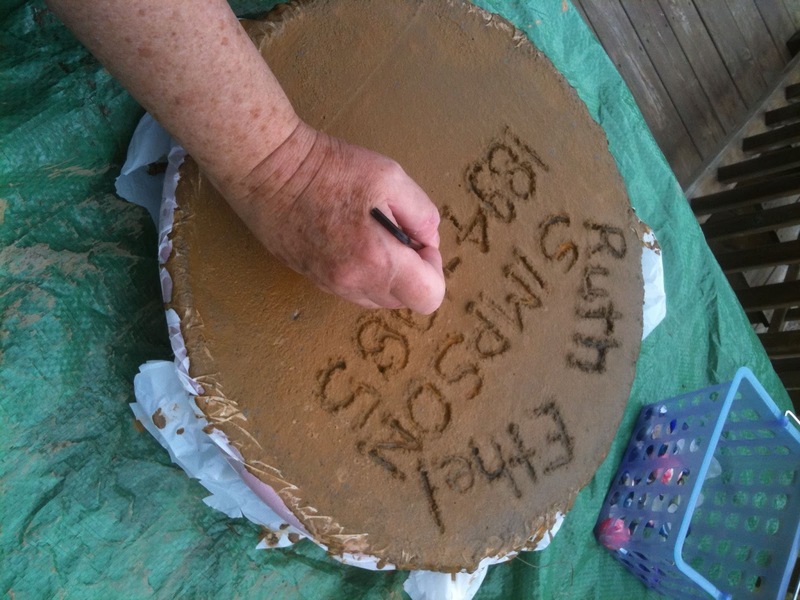 For a pledge of $25.00 I was a backer. My pledge would provide me with one PadPivot, a small carry pouch, a tether strap to hold PadPivot on my leg when in use and a dust cover to protect the Grip Plate. Oh, and the bonus was free shipping for USA and Canada. Canada is rarely included in special deals like that so I was pretty happy. Pledging meant you were backing the development of the product with your money. So you waited. You waited until the protoype units were built, the final unit manufactured, tested and ready to ship. But I didn't mind as my credit card wasn't billed for the pledge for several months. Mind you there were setbacks and I had to wait another 4 months before my unit was shipped. 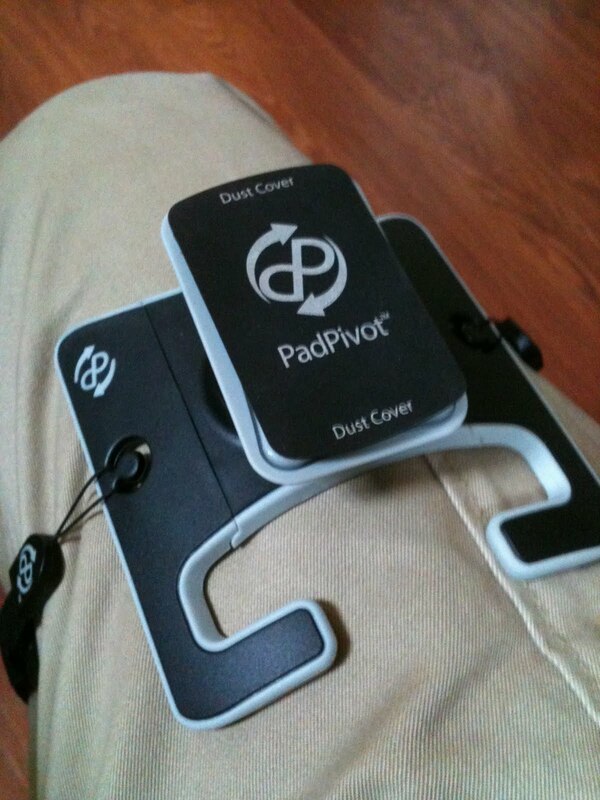 But the two inventors of the PadPivot kept all backers up to date with constant emails and videos. Yesterday I asked my husband to give the PadPivot a test run for me. He used it for several hours and pronounced it of good quality. He liked that it allowed him to have his hands free for texting on his iPhone while using his iPad! He noted that his arm gets tired after holding his iPad for a few hours so this was a great way to rest his arms. 2. Because he had to keep getting up to attend to the dogs or answer the phone, he found it annoying to have to remove the PadPivot. That reinforced his decision that he would not use PadPivot for casual use but rather for extended periods on his iPad. But I pointed out that he could have set the landline phone on the table beside him. Hubs thinks it would be a great thing to have if you were on a long airplane flight or in some other situation where you were going to use your iPad for an extended period of time. 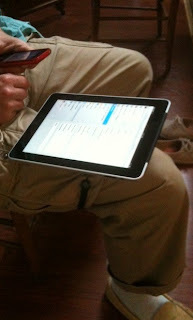 His final summation was that if you use your iPad a lot it is well worth the money. I've been playing quite a bit in Google+ over the last two weeks. I'm liking it. One of the features I've been focusing on is Hangouts. Hangouts are a way of using your webcam and microphone to have up to 10 people together in a chat. You can start a hangout and announce it to specific circles (groups of people you have added) or to everyone. Anyone who sees the notice can join the hangout. That's something to be aware of. You can't kick anyone out of a hangout so if you are just dipping your toe in the hangout water, you might want to start one that is known only to your best friends or family members. Each hangout has its own URL. That URL can be shared as a link to invite others. However, only Google+ users are able to join. Or just join one that you see already in progress. Once you get comfortable with the idea, jump in and start your own. You can start a hangout from the stream whenever you want. You can either go to plus.google.com/hangouts or click the blue Start a Hangout button on the side of your stream. Once you are in a Hangout you see a horizontal bar of video images of those who are in the hangout. Whenever someone starts talking, their video image pops up as the large image above the horizontal bar of smaller images. That way you know who's talking. You can mute their video or microphone if you don't want to see or hear someone (perhaps they are behaving badly or they've got noise interference or... ). You can also mute your own. It's nice if participants mute theirs if they're racked with a coughing spasm! You can unmute at any time. You can also text chat while in the video chat. We did that yesterday in a hangout as we had a participant who is deaf. She lip reads but because her lag was so extreme she could not see the lips of those talking. So we typed in the chat window to help keep her up to speed on what was being discussed. I suggested that she consider starting a weekly hangout where she could teach sign language to anyone interested. I'd attend! She seemed to like the idea so today I'm going to write to her to encourage her to set one up. Yesterday I spent an interesting hour discussing genealogy and some technical aspects of Google + in Mark Olsen's Marathon Hangout which has been going for over six days now. Mark contacted me earlier in the day to ask why I'd not dropped in and to invite me to join him for an hour dedicated to discussing genealogy and Google+. I'm glad I went! It was great to meet new people and to hear new ideas. I've been thinking a lot about the use of Hangouts and one thing I'd like to try is using Hangouts for family chats. My idea is to arrange a time and day (perhaps once monthly) then let siblings, nieces, nephews and kids know. They would all be in my circle called FAMILY. So I would start the hangout and invite only that circle. Family members who want to join in could do so. It would be so nice to have all of us able to see and hear each other and even the grandchildren could gather around to participate with their parents. In effect you'd have a virtual Family Reunion. 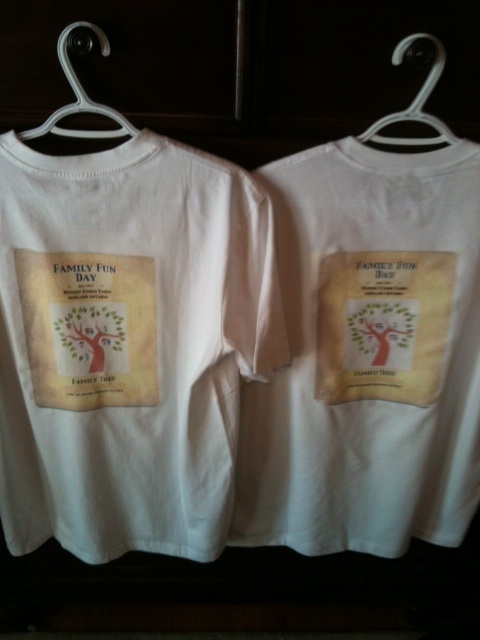 And my readers know how much I love Family Reunions! 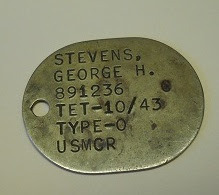 I found George H. Stevens dogtag in my deceased father-in-law’s belongings and want to return it to the owner or his family. My father-in-law served in the Pacific including Iwo Jima. With the help of dedicated readers, we've had great success on Olive Tree Genealogy and on Ask Olive Tree Blog finding descendants of soldiers to return dog ID tags. Let's send this dog tag home! My father-in-law, Terrence Lee Rhoades, enlisted in Jacksonville, Florida. He served in the Pacific including landing at Iwo Jima. At wars end he was sent to China before returning to the United States. He served his country until 1969 including being severely wounded in Vietnam. It was a bit nerve-wracking but thanks to Thomas MacEntee's skill as host, it didn't take long for me to feel relaxed and comfortable. If you missed the show, enjoy it now! 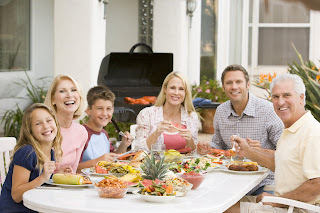 If for any reason you can't listen to the show here on Olive Tree Genealogy blog, visit the BlogTalk Radio site to hear all three of us give our views on how to hold a fun and successful family reunion. 4. In the results, find the user name you want and click on it. 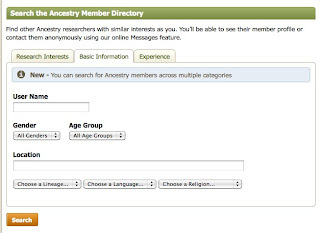 A list of their family trees, message board posts and a way to contact them pops up. Recently I read in the Washington Post about an application for acceptance into the DAR (Daughters of the American Revolution) lineage society. The first application was refused so the individual resubmitted using DNA results as part of the proof required. The DAR refused to accept it saying they do not accept DNA results as evidence of relationships. This attitude puzzles me. Why would a society or organization that is supposed to be dedicated to finding the truth of relationships rule out a piece of that evidence? DNA testing is a piece of the puzzle. It's not the final answer but surely it counts towards finding the answer. If census records, vital statistics and other documented life events carry weight towards proving a relationship from Person A to Person B, it seems to me that excluding DNA evidence is extremely short-sighted. 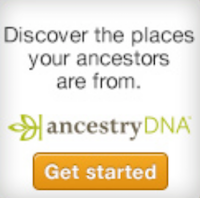 Kudos to those lineage societies who do allow DNA testing as part of the submission process. Shouldn't all lineage societies keep up with technology and embrace new methods of finding the truth about our ancestors and our descent? I'm not saying the DAR was wrong to refuse the original applicaton, but I am saying they need to keep up with emerging technologies and allow DNA to be part of the proof submitted by an applicant. Yesterday a package arrived in the mail. 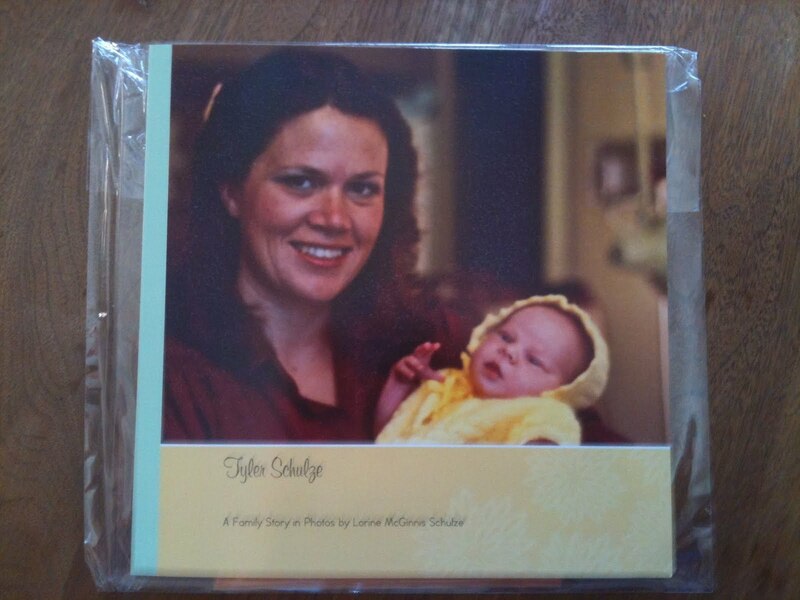 It was the photo book I created using Shutterfly, an online self-publishing service. This particular photo book is a 43 page 8x8 soft cover featuring one of my sons from birth to adulthood. It looks great! Readers might remember that I've also used Lulu and wrote about my experiences with that self-publishing site in a previous post. I have to say that I prefer Shutterfly. The user interface is easy to use. The templates are very nice and there are many choices. You start your photo book by choosing Custom Path or Simple Path. 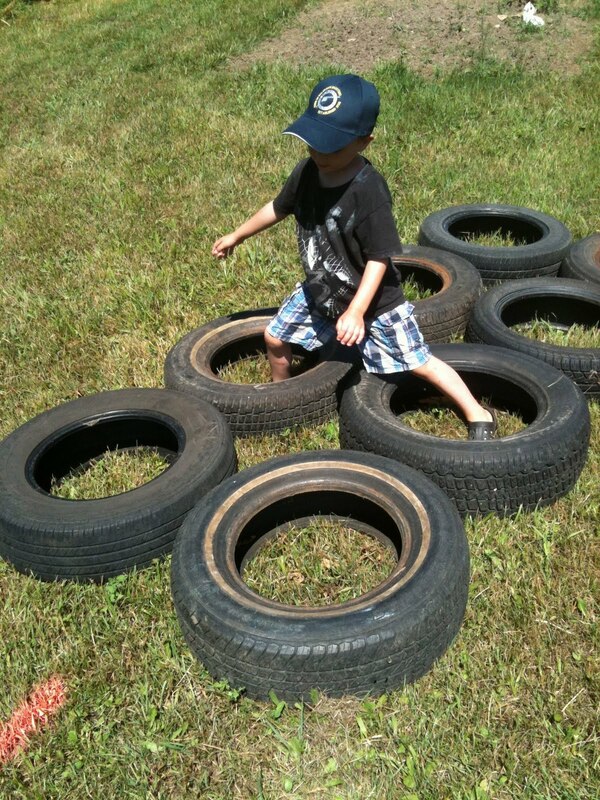 Custom Path has more choices and you can have more photos on each page but it is a bit more complicated. Uploading your photos is not quite as easy on Custom Path as on Simple Path. I liked both methods - Simple and Custom Path but I preferred the creative control and options I had with Custom Path. The only drawback to Custom Path for me was that I couldn't use PIcasa to upload my photos. Using it made things fast and easy. But I found a way around that restriction by creating a Shutterfly account and using Picasa to upload my photos before choosing my book template. Creating my photo books was a snap. 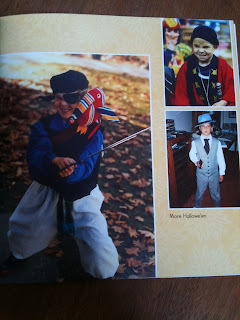 The first time I let Shutterfly insert the photos where it wanted and automatically create a book for me. Then I just moved photos around as I wanted. 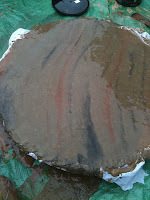 That proved a bit tedious so next time I had Shutterfly upload my photos but not do any arranging on my behalf. I found that much easier and less confusing as I could see all my photos in my photo tray. When I used Custom Path I had fun switching backgrounds and themes until I found the one I liked best. All in all it was a simple matter to insert photos, write some descriptive text for each one and then publish my books. 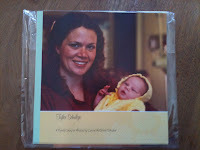 I'll definitely choose Shutterfly over Lulu for my next photo book projects. Christmas isn't that far away and I'm excited about creating some amazing photo books for my family. Disclaimer: Shutterfly did not ask me to write this review, nor did I receive any compensation for writing it. Olive Tree Genealogy to be a Guest on GeneaBloggers Radio! I am super excited to be a guest on GeneaBloggers Radio on Friday, July 22, 2011 starting at 10pm Eastern, 9pm Central, 8pm Mountain and 7pm Pacific with special host DearMYRTLE discussing Until We Meet Again! 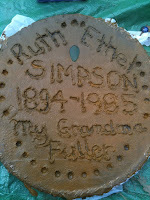 - Family Reunions and Genealogy. "Our special guests will include: Edith Wagner, founder, publisher and editor of Reunions magazine and reunionsmag.com; Marilyn Stewart, better known as “Aunt Mo” who runs the Family Reunion Helper website; and Lorine McGinnis Schulze of the Olive Tree Genealogy Website. We’ll be discussing how to plan your next family reunion, how to include fun activities for all ages, and how to include your genealogy research to share with family reunion participants. " Won't you join me on Friday night? It should be a fun show! 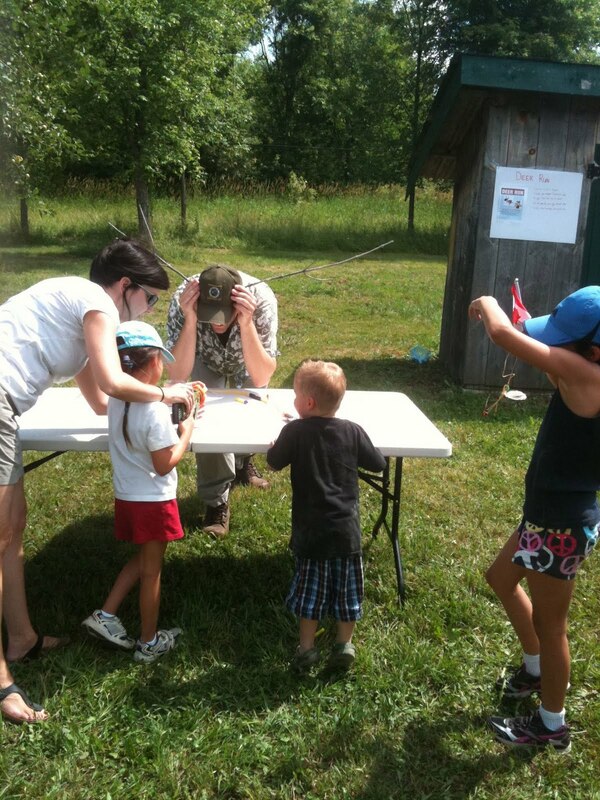 Family Fun Day was Saturday. It was a record day heat-wise - 32' Celsius and humid with no breeze. Phew. We had lots of water on hand although every family member and friend brought plenty to keep themselves hydrated. We had a turnout of 26 (7 of those were children aged 3 to 9) as a few who were slated to come had to opt out at the last minute. 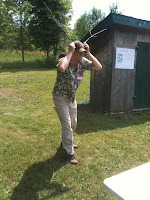 I like to let folks mingle for about an hour and then we start the organized games. 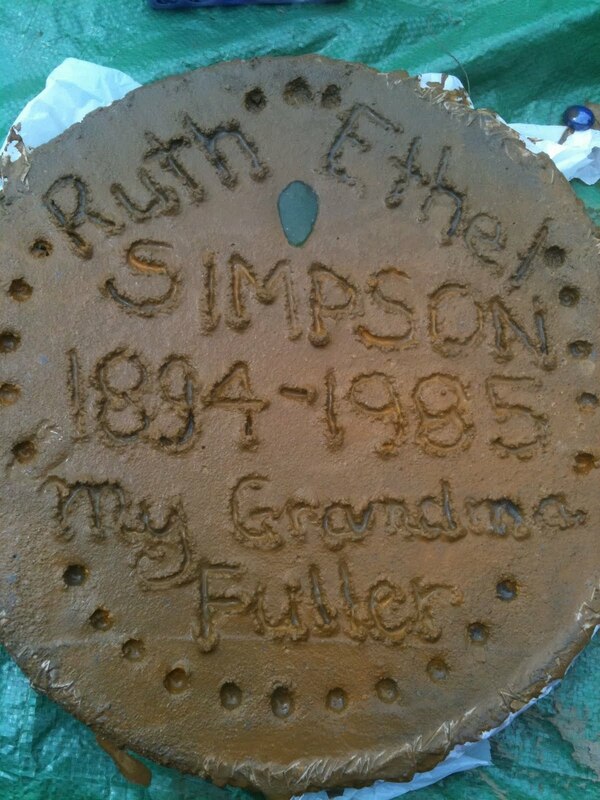 The events were all genealogy themed and based on an actual event in an ancestor's life. 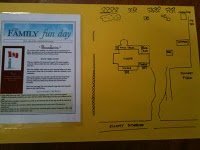 See Part 1 , Part 2 , Part 3 and Part 4 of this series of Genealogy Games for a family reunion. Finally I can tell you about the actual events! Wampum Central. Based on our Dutch ancestor Cornelis Van Slyke in New Netherland (New York) in 1637. Wampum was used as money instead of paper or coin. Teams had to find two red, two black, one green and one white bead buried in a wading pool full of corn. Then they had to string the beads on to a piece of embroidery thread, add a guinea feather and show Cornelis Van Slyke (played by me) to get their egg and next clue. 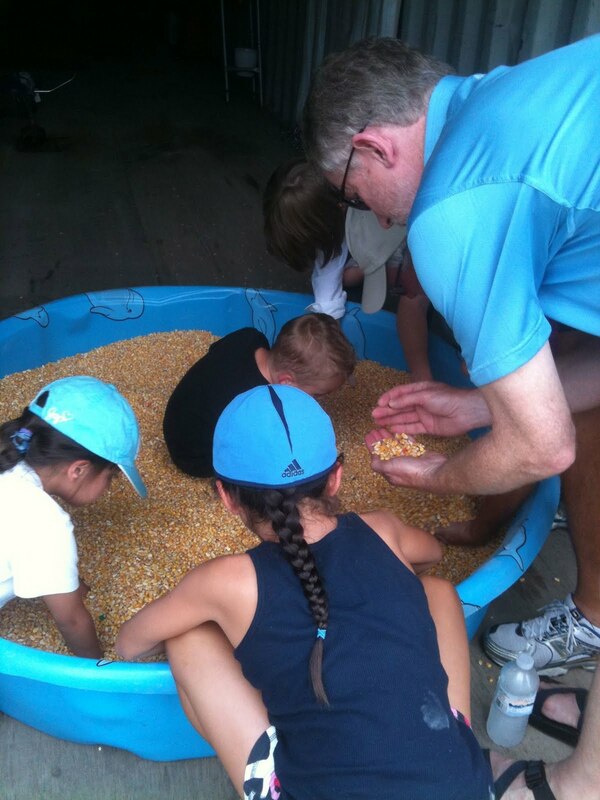 At this event, the children jumped into the wading pool and were covered in white corn powder by the time they found their beads. Apple Alimony. Based on my ancestor Albert Andriessen de Noorman who was ordered by the courts in 1680s to pay his ex-wife Geertruy 80 bushels of apples yearly as alimony. Teams had to take a small plastic basket and fill it with apples from our apple trees then find Geertruy (played by my 87 year old auntie!) for their next egg and clue. Eileen Vollick Flight School. 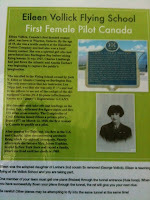 Based on our cousin's achievement of becoming the first woman in Canada to get a pilot's licence in 1917. Teams had to toss frisbees (which I decorated with photos of Eileen in her flight uniform and plane) through a swinging hula hoop. 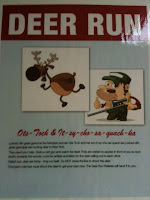 Deer Run. Based on our Mohawk ancestors Ots-Toch and her son It-sy-cho-sa-quach-ka (his non native name was Jacques Van Slyke). We set out nerf guns and a nerf bow and arrow as well as small brightly coloured rubber balls. Teams had to stand behind the coloured ropes and watch for deer (played by my husband who hid behind a shed and scampered out to dart and weave and taunt the shooters). A direct hit by any weapon on the table earned them their next egg and clue. A great favourite with adults and children alike! 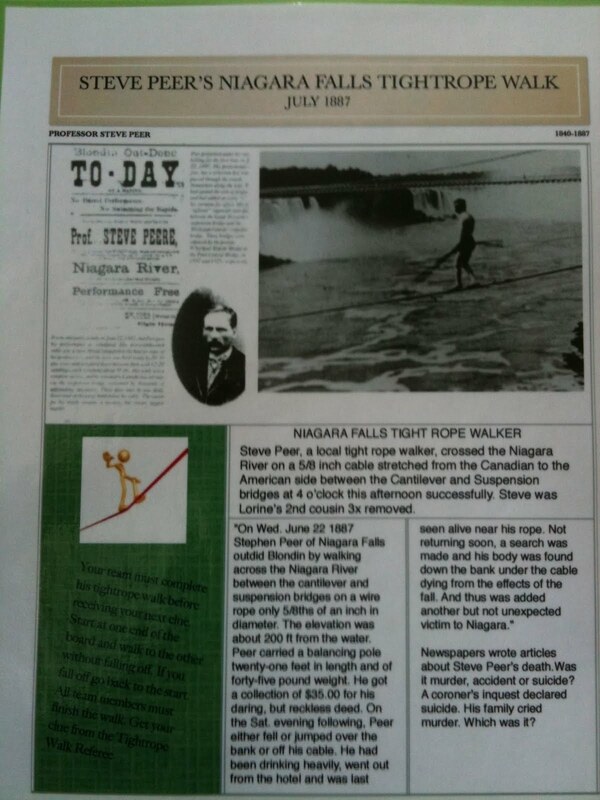 Steve Peer Niagara Falls Tightrope Walk. 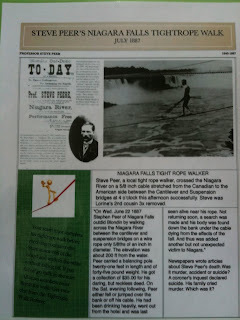 Based on my great grandfather's cousin who walked Niagara Falls on a tightrope. Teams had to walk across 3 planks raised about 6 inches from the ground. Mary Vollick's Escape From New York. Based on my Loyalist ancestor's wife flight from New York during the American Revolution. American patriots turned her and her 10 small children out of their home, burned the house to the ground then marched her into the woods several miles and left her there. She managed to get all of her children to safety in Montreal Canada. Teams had to carry 10 stuffed animals to safety through an obstacle course. 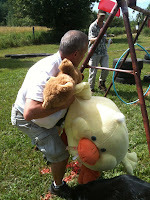 The catch was that only one team member could carry the stuffed animals but the entire team had to complete the course. Tee for Two. A golf maze based on Scottish ancestors. I set out croquet wickets and buried small cups in the ground. 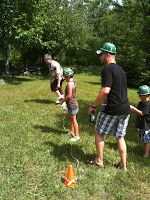 Teams had to use a tiny children's golf set to get their golf ball from the starting point, through the wickets and into the cup at the end. WW2 Grenade Training. Based on my dad's service in WW2. 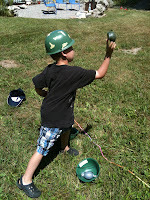 Teams wore toy helmets and tossed toy grenades into a hula hoop on the ground. 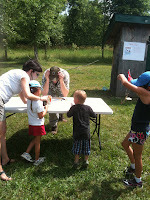 The children loved this game! Ancestor Match. A puzzle game. 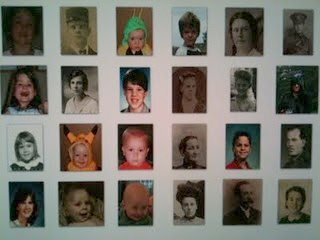 I printed off 24 head and shoulder shots of ancestors and baby photos of some of those attending Family Fun Day, then printed out 26 names. Teams had to match names to photos. Everyone seemed to enjoy themselves and after we had all cooled down, we had our corn roast with barbeque chicken and hot dogs plus salads and desserts. 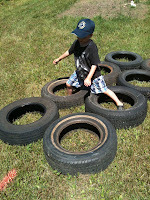 Then the children went frog hunting at one of our smaller ponds and ended their day with ATV rides with my husband. Lots of fun and I can hardly wait til next year to do it again. The promotion will start today, Friday the 15th at 6PM CDT and will end Thursday, July 21, 11:59PM CDT. Kits need to be paid for by the end of the promotion. Discover the wealth of information available in London's repositories as NEHGS returns to London in 2011. Participants will take part in two group dinners, consultations, and guided research tours through the Society of Genealogists (SOG) and the National Archives (UK). · Military Personnel Records - this exciting compilation includes personnel records from the Vietnam War and Gulf War eras. With nearly 16 million in all, these records provide information about individuals who served in the Air Force, Army, Marine Corps, Navy, and National Guard. · Texas Birth, Death, and Marriage Records - these records date anywhere from 1800 to 2011 and cover the following counties: Fort Bend, El Paso, Cooke, Montgomery, Tarrant, Burnet, Hood, Denton, and Kaufman. There are 1.4 million new Texas records in total. · Colorado Marriage and Death Records - newly added Colorado records are from Delta County, a region located in the western part of the state. Over nine thousand new records have been added. · South Carolina Marriage Records - this collection of four thousand early South Carolina marriages covers years 1641 to 1799. To find your ancestors in these new records, log in to Archives.com and run a search. We'll return all matching records, many of which may be new since the last time you visited! Gogo Navigator USA & CAN is a real-time 3D navigation app for the iPhone. It features real-3D, Live Traffic (an in-app purchase add-on), Text-To-Speech voice guidance, Lane Guidance, Signpost Display, and more. 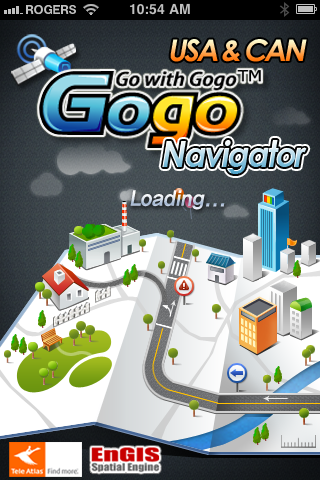 There are so many options in Gogo Navigator that when I first downloaded the app I was overwhelmed. 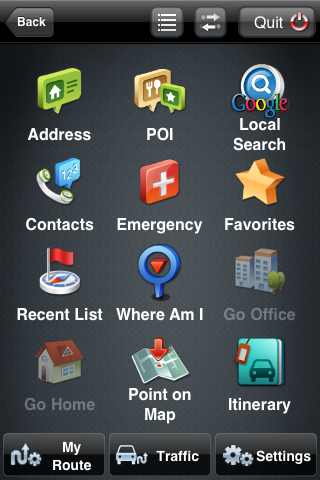 There are many cool features such as the voice commands and the 3-D display. I had a little trouble understanding the voice commands but hubs had no problem at all. I think some minor tweaking at my end to adjust volume level will likely solve the bit of trouble I had. Hubs and I have always had problems on our road trips. And we make a lot of genealogy road trips! So Gogo Navigator seemed like a good fit for us. I did notice that my iPhone battery drained quickly when I was in Gogo Navigator but that's common to any GPS system on your phone. A quick side trip to the Gogo Navigator website gave me the solution. I had a few choices to minimize battery drain but the one I used (and it works well) was to be sure to use the QUIT button in Gogo Navigator instead of just using my Home button on my iPhone to go to another app. Using the QUIT button ensures that the GPS is not running in the background. Easy to do and a perfect solution. Also when in the car, and using Gogo Navigator on your iPhone as your GPS of choice, you can plug your iPhone in and the battery won't drain. I've been using Gogo Navigator for a week now and what I love best about it is the Live Traffic Report. Live Traffic, with information provided by Clear Channel Total Traffic Network. 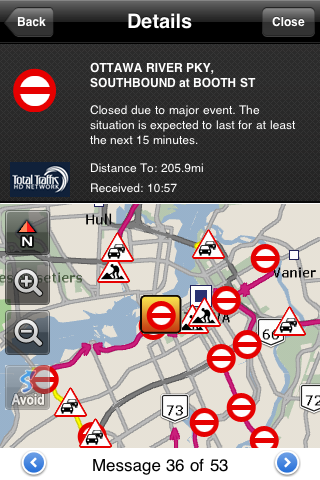 gives you an up-to-date report on road conditions on your route Are roads closed? How long are they expected to be closed? Is traffic slow but the roads are open? These questions and more are answered on LiveTraffic. To access LiveTraffic you choose your destination, then Gogo Menu and then Traffic (the bottom middle button). 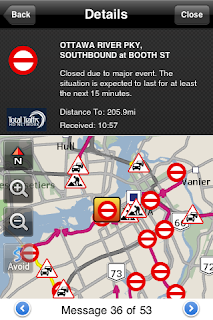 The next screen takes you to Traffic List screen and a choice of All Messages or On My Route. 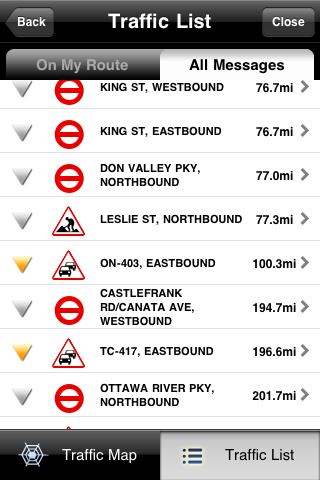 The icons tell me what the problem is - construction, road closure, etc. I can click on the right arrow (beak) for details including what the problem is and how long it is expected to last. The exact time the problem arose is also given. The next road trip hubs and I take for genealogy research should be much less stressful. We use a GPS system already and it saves us lots of headaches as we head out to unknown cemeteries, libraries or museums in cities and towns unfamiliar to us. But I'm going to use Gogo Navigator on our next trip. With the Live Traffic add-on in Gogo Navigator it should all be smooth sailing! Last week I finally got an invite to join Google+. Why do I say "finally"? Because invites have been few and far between, and even those who were lucky enough to receive an early invitation were often shut out. Google opted to keep the doors to Google+ shut much of the time, preferring instead to control how many new members were using the site at any one time. If you don't know what Google+ is, it's actually called the Google+ Project. That's its official name. You can read about it at the official website. I love going there because I get a little notice saying I'm part of a small group of people who are helping to test this new offering by Google. Makes me feel important! All levity aside, Google+ is pretty cool. It's a new social networking site and having played around in it for several days now I'm categorizing it as a combination of Facebook, Twitter, LinkedIn and Skype. A good combination. Google does it well. In Google+ you have Circles. They consist of your social network. Your Circles can hold friends, family members, business associates, people whose comments you want to follow but you don't necessarily know. You set your own circles and then you simply click and drag to drop people into them. It's a great interface and easily managed. People can be in more than one circle and that's important if you want to filter your news stream. For example, I have 91 people in my circles now. That's not very many but the chatter on my news stream is constant and sometimes overwhelming. So I put some of those 91 people into a second circle I called "FAVS". Now I can filter my news stream to only see posts by those people in my FAVS circle. I can still see the others by choosing any circles I want, or all my circles. So I might pull in my FAVS several times a day but only pull in all my circles once a day. Google+ also has Hangouts. These are Video Chats where you very quickly start a Hangout by dragging and dropping a friend or an entire Circle into the Hangout with you. Bingo you are chatting. You can enable or disable your webcam if you're in your PJs and someone drags you into a Hangout. You can also mute your microphone and simply chat by text. I haven't actually been to a Hangout yet. I started one but no one was online that I was comfortable chatting with. I want to start with a good friend or family member first. In Sparks you choose an interest (I chose "genealogy") and add it to your personal Sparks. Sparks then provides you with a constant feed of news about your topic of interest. It's easy to keep up with the latest happenings and share things with other friends who have the same interests. I've got "genealogy" and "recipes" going right now but am going to play with Sparks and see what else I can get. It's kind of like a Google Alert except it's not coming into your email box. This is what I'm loving most about Google+. When I am in my gmail account for example, I can see my Google+ notifications at a glance. I can comment on posts directly from my gmail. I can see who has added me to their circles and I can add them to mine right in my gmail account. No need to open another browser window or leave my mail program. This is a big plus in my opinion. Profiles are your personal page with your information. You share what you wish to share and you have complete control over your privacy settings. One thing I suggest is that when you join Google+ take a few minutes and fill out your Profile completely, including a photo, before you start adding people to your Circles. It will make it much easier for your friends to determine if you are the right Sally Smith they want to have in their circle if they can see a photo and a little information about you! I've got a lot more exploring to do in Google+ and I've got a lot more to learn about how things work and how I can make it work for me. But I've learned a couple of things that might be of interest to some of my readers. I don't advise using a third party service such as gplus (which is not a Google service) to create a vanity URL. Why would you do that when Google+ does it for you quickly and easily? 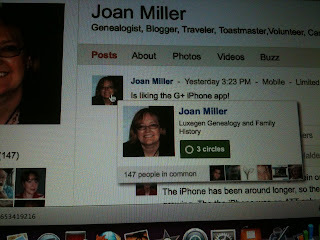 Many of us are genealogy bloggers and we want our blog posts or titles to go to Twitter and Facebook and now to Google+. So I hunted around and discovered that you can sync Google Buzz to your blog(s) and then enable Buzz in your Profile. That pulls your blogs in to Google+. 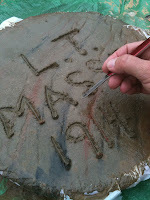 I'm pretty sure there will be a better way, if not at present, soon, but for now I'm using this method. I'd love to hear from anyone whose figured out another more efficient way of pulling in an RSS feed! This is similar to the Facebook "Like" button. If you read a post from someone in your circles and you think it's great, click the +1 button. That tells others reading it that you consider it interesting or thought-provoking or humorous. You can also Share it with others and pass on good posts that way. I've only been in Google+ a few days. But I like it. I like it a lot. I will at some point have to decide how I'm going to manage my social networks. Will I give up Facebook in favour of Google+? Is there room for both in my life (with some tweaking so that there is no duplication)? Is Google+ a flash in the pan? 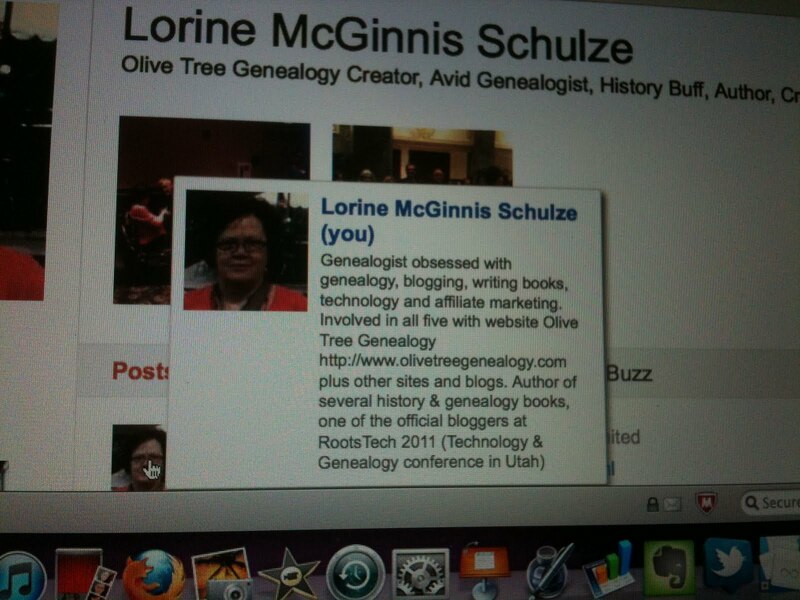 I want to interect with other genealogists and bloggers. I want to keep up with emerging technology, and I'm going to be choosing the platform(s) that best enable me to do those three things. Perhaps I will keep Facebook for Family connections and Google+ for everything else? I don't know yet but I'll be considering my options carefully over the next few weeks. I don't want more work. I don't want more reading. So my final decision will be carefully thought out with one of the main criterias being that my work load does not increase. My annual Family Fun Day is fast approaching and I'm still creating posters, flyers and other items needed for the Amazing Ancestor Egg Race. I'm also busy organizing all the materials I'm going to have to set out the morning of the reunion. 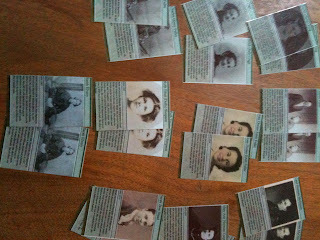 I talked about what else I've done to create Genealogy Games for a family reunion in Part 1 and Part 2 of this series. 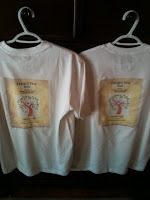 Yesterday I completed the t-shirts which are the prizes for this year's winning team. This year I did iron-on transfers as I didn't have the time to create hand-painted t-shirts. In my genealogy themed race, family members in teams of two must complete events in order to receive coloured plastic eggs containing their next clue. Each clue directs teams to the next event. Each event is based on an actual event in the life of one of my ancestors. 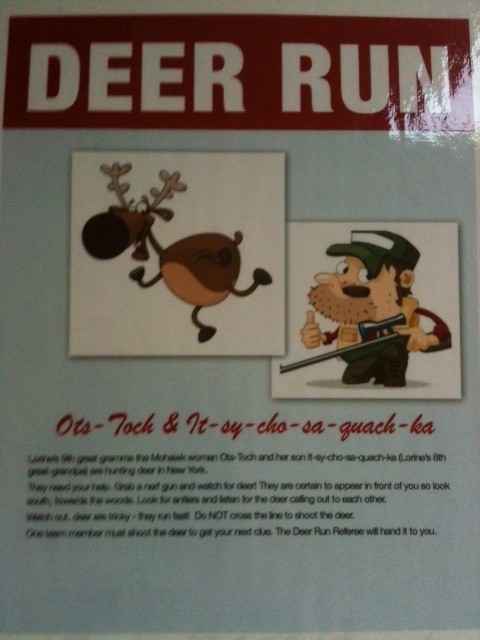 Deer Run In this event teams must help my 9th great grandmother Ots-Toch (a Mohawk French woman) and her son It-sy-cho-sa-quach-ka aka Jacques Van Slyke, my 8th great grandfather, hunt deer. I don't want to reveal how I've got this set up as too many of my family read my blog! 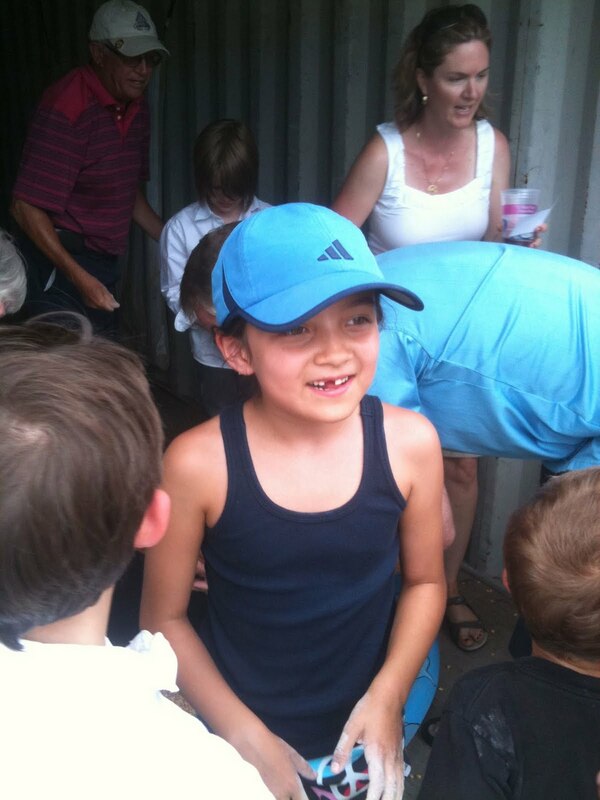 Some of them will be trying to get a little edge on the rest of the players by reading my blog for clues. But it's not giving away too much by saying that using the tools I'm providing, teams must prove their ability to hunt alongside our ancestors Ots-Toch and Jacques. 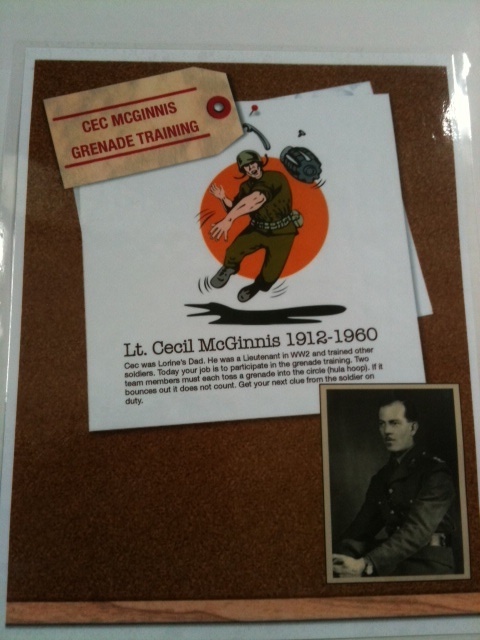 WW2 Grenade Training Course. This event is based on my dad's military service in WW2. I bought toy grenades and toy army helmets at the Dollar Store and can hardly wait to take photos of my family and friends donning their helmets and tossing grenades to achieve the event goal. I can't describe any more events I've got planned as that would give away too much to my family. But there are several skill testing challenges, all genealogy related, and one ancestor puzzle to complete before the final pit stop. Every event will have a referee wearing a name tag of an ancestor connected to the event. Most events will have a ref watching to make sure teams don't cheat. Yes, my family are known for cheating in order to win. One year two of my nieces (fully grown adults with children of their own) hid the scavenger hunt items as they found them so that other teams could not finish the hunt. Some events don't have a referee watching the teams. 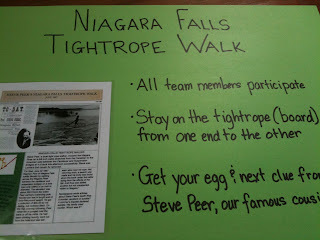 When team members complete that event, they must find a specific ancestor and show that ancestor their completed task. This is designed to slow teams down and scatter the field a bit. 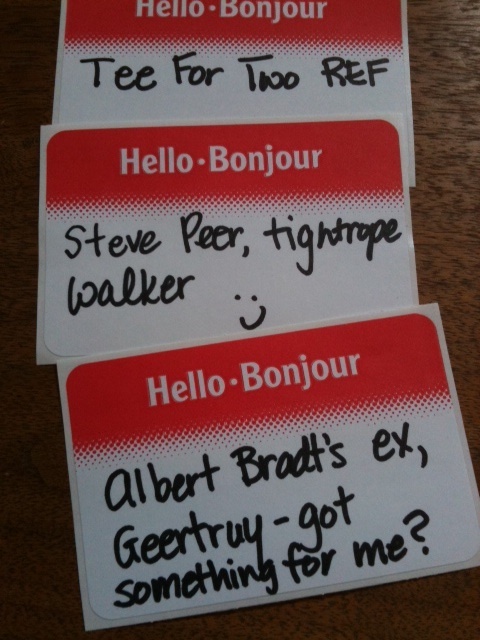 Observant family may already have noticed some people wearing name tags of ancestors and will know who to look for. 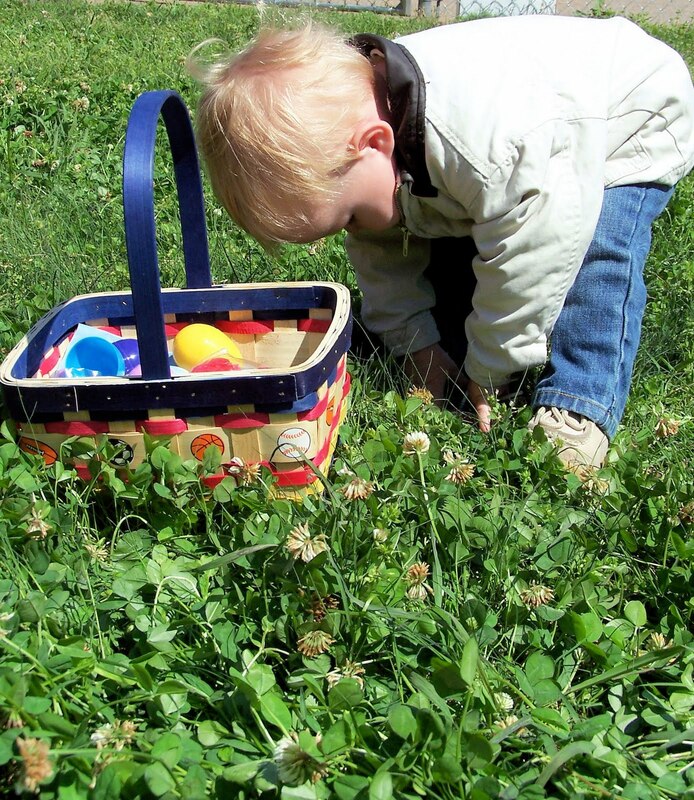 Others will have to race from person to person to determine who has the next egg and clue. After creating all the genealogy ancestor events, I wrote out clues that will move teams along from event to event. 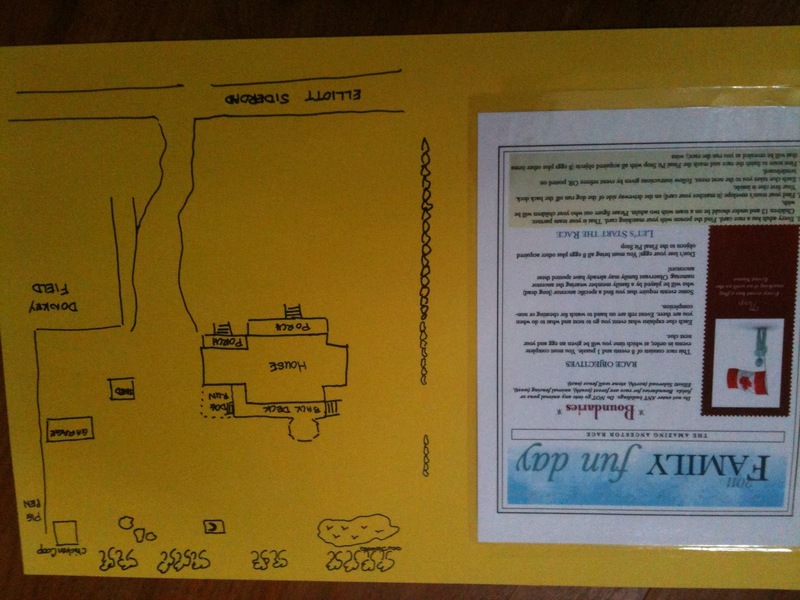 I had to make 15 copies of each clue as I expect 15 teams will participate. Then I folded the clues and inserted them inside plastic coloured eggs. Each event has a basket of eggs (labelled so I don't forget what basket goes with what event!) which the event referee can quickly grab just before the race begins. 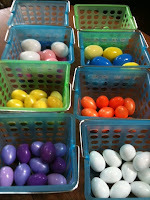 I also created a master list of clue numbers and egg colours in case a basket gets spilled. 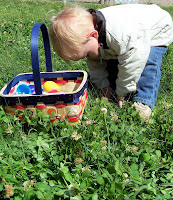 Can you imagine trying to remember where the purple or yellow or.... any colour eggs go? So I have a list that shows that purple eggs belong to the referee for the Deer Run event, yellow eggs are with Grenade Training and so on. Part of the fun is that teams must bring all their coloured eggs with them to the final pit stop. That should be in interesting exercise to see how creative my family is in figuring out how to carry those eggs. 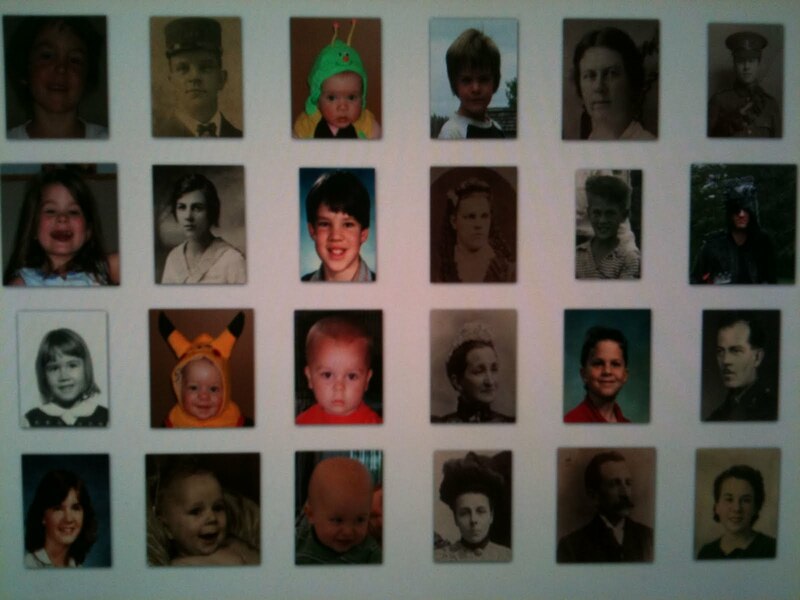 22 Twenty-two collections for 10 countries were updated recently at FamilySearch.org. The Germany and Mexico church records were the two largest collections added. Collections were also added for Brazil, Canada, Guatemala, Italy, Norway, Sweden, and the United State. See the records online now at FamilySearch.org. WorldCard Mobile App created by Penpower Technology Ltd. is my new best friend. I love this app! When I was first approached by the developers to try this app and then review it, I wasn't sure how useful it would be. But I'm a huge fan after trying it out. Basically WorldCard Mobile scans business cards and then using OCR (Optical Character Recognition) technology, reformats the card information and adds it to your Contact List in your iPhone or iPad. What a time-saver and how I wish I'd had this app when I was at RootsTech in February 2011. 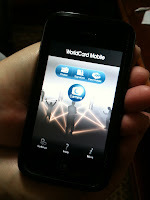 I tested WorldCard Mobile on dozens of business cards. Some were crowded with information or used abbreviations but WorldCard Mobile was able to convert them all and enter them in the correct fields in my iPhone contact list. The only one it had trouble with was a card with the person's name and a fancy character beside the name. WorldCard Mobile thought the fancy stylized character was part of the name but that was a very understandable "mistake" and easily corrected. 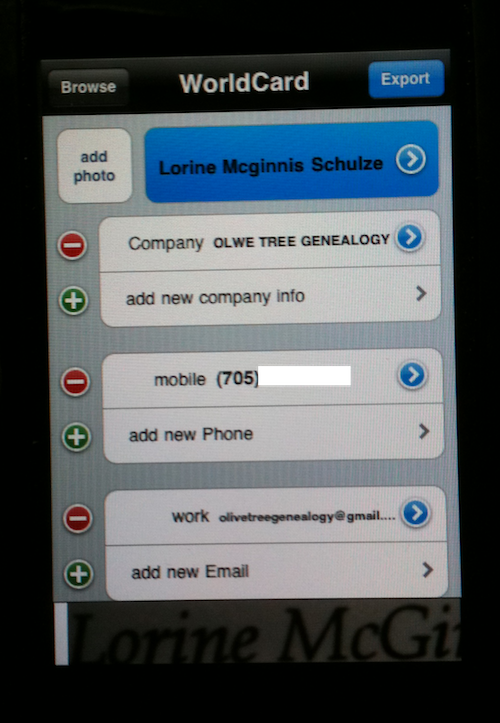 After WorldCard Mobile exports the business card information to your contact list you can edit as usual. So a quick Edit then delete of the erroneous character solved the problem. All it takes to use WorldCard Mobile is a simple click of the app's built-in camera - you align your phone with the card using the on-screen image, then click. If the photo is clear and you're happy with it, you choose "recognize" otherwise you redo it. I never had a problem getting a nice clear shot the first time and I don't have the steadiest hands in the world. 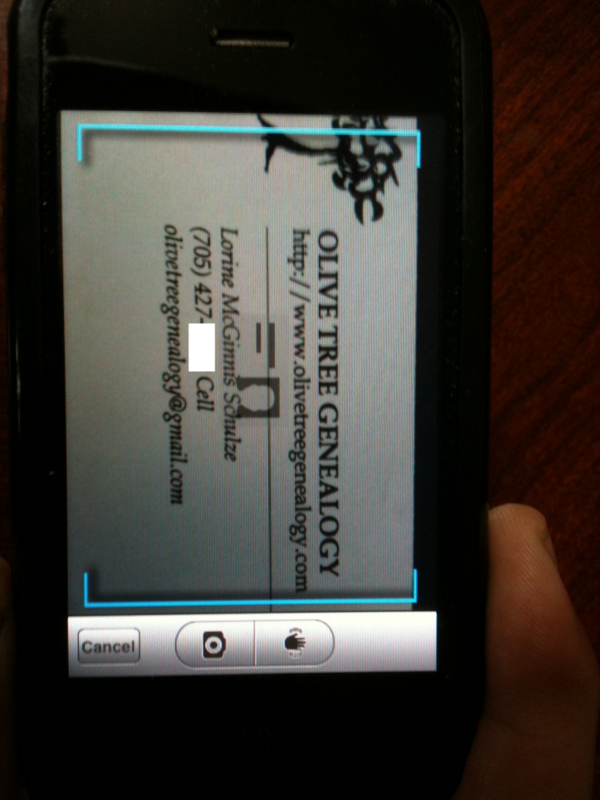 After happily scanning all my business cards into my contact list, I checked out their option called "Signatures" Wow. Using this option you can transfer email signature lines (names, URLs, phone and fax numbers, job titles, etc) into your iPhone contact list too. All you do is copy the signature line(s) you want imported, then follow the simple instructions in WorldCard Mobile and all the information is quickly and easily imported into your contact list. It truly is that fast and easy. There is also a CardHolder which keeps copies of all the business card images which you can then organize into groups. I didn't play with this option but it looks interesting. You can also import existing images of business cards from your photo library on your iPad or iPod Touch and they'll be converted and added to your contact list. Your iPhone needs to have auto-focus so this app isn't recommended for 3G but it works great on 4 or 3GS. I used it on my 3GS and had zero problems. It's fast. It's easy. And that makes me very happy. WorldCard Mobile app recognizes 7 languages: English, Dutch, French, German, Italian, Portuguese, and Spanish so it would be very handy on a genealogical research trip. 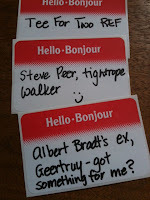 I can hardly wait for my next Genealogy Conference - you know, the ones where we gather business cards like mad! Last conference I was at, I lost some of the business cards I was given. If I'd had this app I would have immediately scanned the cards so no danger of losing that important contact info. A few days ago I discovered that Ancestry.com has Yorkshire England records online. If you have Yorkshire ancestors, you'll want to run, not walk, to search them. My son has Yorkshire lineage through his dad (Schulze, Hill, Dewhirst, Metcalf, Scholfield, Horner and more) and using these databases on Ancestry.com I was able to find dozens of church records for ancestors I already had in my genealogy program, and learn new names to add to his family tree. 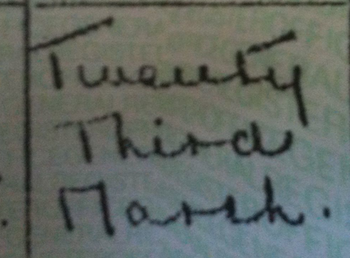 Even for the ancestors I had previously found, what a bonus these Yorkshire records are! The marriage records give the father's name and occupations of both fathers, plus the groom. Residences are listed. In one day of intensive searching I found literally dozens of new details and several new ancestors for my son's paternal line.